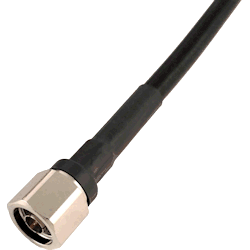 Connector for unterminated 400 coax cable. Connects to coax cable terminated with N-female connectors. Easy-on application requires no soldering, results in a professional look. Prepare unterminated cable end with CST400 coax cable prep tool (sold separately). Slip polyethylene sleeve and crimp tube over cable. Attach connector to cable end. Pull crimp tube up to connector base, crimp in position with DL‑801K ratchet crimping tool (sold separately). Fit sleeve around crimp tube and apply heat gun to shrink sleeve in position.